Stephen Eager performs dramatic musical presentations that challenge the mind and stir the heart. 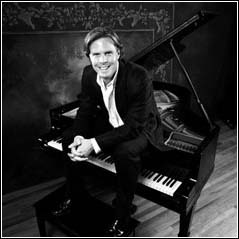 His current repertoire includes dramatic biographies of Beethoven and Schumann, musical presentations of Scottish Revivals, and an evening of Song & Romance. Each of Stephen’s programs brings new insights to the characters and subjects he develops. Make no mistake; these productions are unique. Each show is designed to give the audience an experience unlike that of any other theatrical show or musical concert. These five programs will take the viewer inside the minds of the characters depicted in ways that entertain and educate. Using his skills as an actor, pianist, vocalist and writer, Stephen brings excitement back to the one-man show. Whether exploring the lives of Beethoven and Schumann, marveling at religious awakenings in the British Isles, or wandering into romance through story and song, these productions will open your eyes to distant times and far-away places and bring them to life for you in new and entertaining ways. Stephen has a Master of Arts in Music & Drama, studied piano with Lawrence Morton and Jerome Rose, taught Music & Speech in Chicago, and teaches piano in Greenville, SC, where he resides with his wife Betsy. — You are visitor 18,749 to our site!